I am liking what is going on in our kitchen during week #3. It is starting to get very interesting at the Frantz house. The week started with more floating, taping and some new texturing on a few walls. Shaker-style cabinets were also delivered. Gilbert is Finishing Touches amazing cabinet maker. Geez … even unfinished, I can already tell our kitchen is going to exceed our expectations! Gilbert and crew spent two long days working their magic. During our planning meeting a week or so back, Rick and I asked for a few subtle changes to the cabinet detail to add a tad bit of character and he delivered! Another amazing breakfast cooked on the grill … veggie egg white omelets and sausage! We even plugged in the toaster in the living room for some toast. Felt so much like camping out during our college days cooking on our propane Kangaroo Kitchen! The week ended on Halloween with the painters coming back in to start preparing the cabinets for paint. Our very pregnant daughter, awesome son-in-law and little Jacob drove in from Houston to check out the construction zone and trick-or-treat in the neighborhood. What a fun night! Three guesses what happens most of next week! It was my husband who came up with the idea to FaceTime our grandson this past week. I was a little skeptical at first. I mean … Jake is only three months old. Rick thought it would be fun to sing the “Happy Three-Month Birthday” song to Jake … and after about five seconds of contemplation, I totally agreed! “Be sure and pick up one of those little bundt cakes and a candle,” he smiled. Although I totally got the heartfelt sentiment, Rick is one dude with a ginormous sweet tooth. But let’s face it … for every important milestone … there must be cake! And carrot cake from our local bundt cake store is even better. I love how my daughter and son-in-law celebrate Jake’s milestones. Etsy has these cute stickers that you can stick on a onesie. Search for “month by month baby stickers.” They have hundreds of different kinds. Jake’s photos are are startling in their contrast! Is that elephant shrinking or is Jake growing? You be the judge! 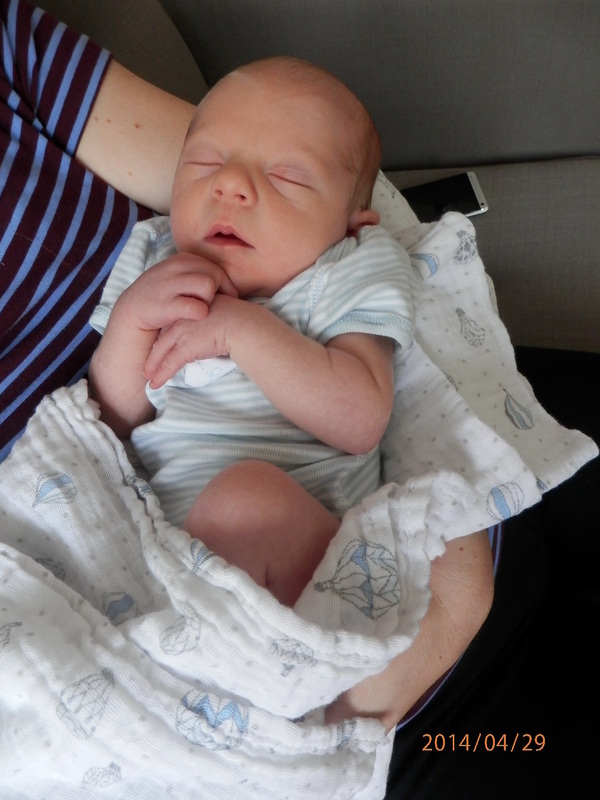 I’ve learned lots of new concepts over the past few weeks about birth before our grandson, Jake, entered the world. The little fellow was in the breech position and, according to doctors, probably will not turn by the time he is born. The news was not what our daughter and son-in-law expected to hear. When Chad heard the news from the doctor, he grabbed his iPad to perform some research. He told me there were some really wacky-sounding ways to nudge a baby to turn 180 degrees. They sounded like old wives’ tales to all of us. But was there a smidge of any truth to be found? Did you know if a mother-to-be places a large bag of frozen peas where the baby’s head is located it is supposed to encourage a “swim” in the opposite direction? I was keeping an open mind. “All we had was a bag of frozen corn. We tried it but nothing happened,” Chad smiled. Katie’s dad thought the idea sounded intriguing but put his own spin on the idea. Rick suggested a bag of frozen chopped broccoli might just do the trick because … wait for it … of course every kid hates broccoli. You see what I have to live with? There are also “baby spinning” suggestions (www.spinningbabies.com) on the Internet involving acupuncture, doing handstands while you are in the pool, getting on your hands and knees to scrub the floor, and playing music with headphones on your stomach. Of course the music one also has an ad for special headphones, called Belly Buds. They only cost $49.99, excluding sales tax and shipping. Who knew? “We tried the music, without the special headphones, but apparently baby boy doesn’t like rock music. All he did was squirm,” laughed Katie. Yoga was also mentioned. Apparently there are a bunch of exercises that are touted as helpful at spinning that baby around. It would be Katie’s luck that baby boy would wind up doing a 360 and be right back where he started. And how about just plain old visualization exercises? Basically, the premise is if you see it in your mind’s eye, he will turn. Sounds like taking wishful thinking to a new extreme. My own personal favorite was the one using a flashlight. “After the frozen corn, we tried the flashlight. It’s where you start at the top of your belly and move to the bottom and hope he ‘moves towards the light.’ It didn’t work either,” Katie chuckled. Flashlights, frozen corn and rock music were all interesting but failed attempts to spin their baby boy around. Jake was born via C-Section last week. I do think the “baby spinning” concepts will make for some very interesting entries in the little tyke’s baby book. Welcome to the world baby Jake! A couple of years ago I decided to kick my quilts up a bunch of notches. I started bringing all my quilt tops to the fabulous Kim Norton, of A Busy Bobbin (www.abusybobbin.com). To say she is JUST awesome is an understatement. In the past, I tried hand quilting. It takes a long time and I wasn’t very good at it. Blame it on being a lefty! I tried doing my own machine quilting. My results were nice enough, but with limited time, I wasn’t cranking out many quilts each year with the added work. In the past, I’d inspected the details on many lovely quilts at various quilt shows, but didn’t think any of my quilts could look that good. When my friend Angela raved about Kim, I decided to give her a try. The rest is history! The most recent quilt Kim quilted for me is for our grandbaby-boy-to-be. He is now the size of a cabbage, as that is the thing to do these days … compare unborn babes to fruits and veggies. We’ll meet him in person in early May! I love bringing my quilt tops to Kim. It’s a blast watching her creative juices flow as the unfinished quilt top is laid over her longarm machine. We talk about the quilt’s vision and then Kim does this little dance with spools of thread that she takes down from her spool rack. She lays strands across the quilt top to see what will work best. We chose a variegated thread. Although I have several awesome custom quilted designs from Kim, lots of the quilts use an all-over, or pantograph pattern. For the little cabbage’s quilt, we flipped through a book and picked out one called “Animal Crackers” from Urban Elementz with zoo animals all over it. I love the results. What do you think? I knew when I first laid eyeballs on the quilt kit at the International Quilt Festival last fall, it would be my first purchase. I mean … our daughter and son-in-law will have our first grandbaby in early May. Hooray! Oh, and our daughter also works at the Houston Zoo (www.houstonzoo.org). Naturally, a quilter, and grandmother-to-be, I had to run out and make a quilt for the little rutabaga. We used to call our grandbaby-to-be a “sprout” for the longest time. It seems now all the rage is to compare their current size to fruits and veggies. Today it is the size of a rutabaga! Picking which animal quilt option was a no-brainer, as back last October we didn’t know if it was a boy or girl. I figured the giraffe was generally gender neutral, although the pink flamingo and the monkey were also pretty darn cute. I have to say applique is not my favorite way to manipulate fabric, but I decided to jump in anyway with both feet. With the help of my trusty “Applique Pressing Sheet,” I could do this project in no time. Made it easier to build the whole giraffe and then fuse one large piece onto the quilt top. Next step is to sew around the edges of the applique pieces before sending it on to my long-arm quilting lady! The adorable animal quilt is published by “The Teacher’s Pet,” http://www.the-teachers-pet.com, out of Baton Rouge, Louisiana. The quilt pattern is called “Peek-a-Boo Pals” and includes all four animals in the pattern. An alphabet chart is also included. I opted not to put a name on it since the first name is not entirely settled.